By now, you’re all familiar with the way that I review movies. It’s not really reviewing so much as sharing my unfiltered thoughts here on my blog. Yesterday, the world of YA fiction got a bit of a surprise in the form of Life and Death, also known as Gender-Bent Twilight. Then my sister explained to me that it was, in fact, STEPHENIE MEYER who came up with that. And just like that, I knew that I was going to read it. Not because I think Stephenie Meyer is all that great a writer (she’s really not) or because I’m a Twihard (I enjoy the books, but not obsessively like Harry Potter or The Hunger Games). No. I knew I was going to read the book out of pure, unadulterated, shameless curiosity. And that’s what I did. After I finished the book (yes, I read it in one day… yes, I’m a freakishly fast reader), I debated whether or not I was going to review it on my blog. As I fell asleep, I was sort of thinking, “Nah… Not really worth my time. Besides, dozens of other bloggers will be doing the exact same thing.” But then, scrolling through GoodReads this morning, I saw that most readers were simply wailing and bemoaning the book’s existence. So I thought, “Oh, what the heck?” and here I am. I need to preface this once again by saying, yes, I read the original Twilight saga and yes, I kind of love it. I thought it was a fun story with magic and great escapism. It’s the kind of book that, while the writing not be great, you leave the world feeling like you belonged there and the characters in that world feel like old friends. It’s exactly how books you love are supposed to make you feel. 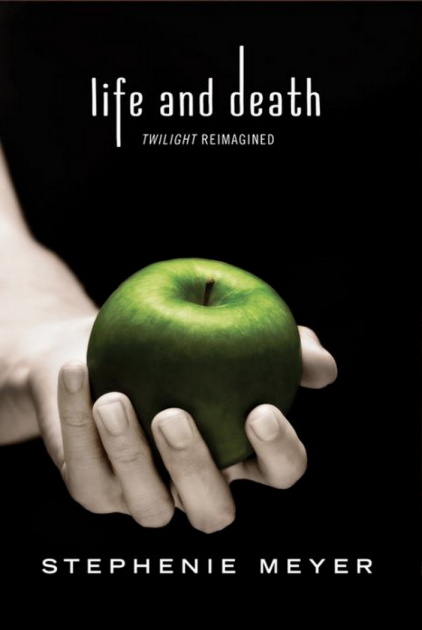 That being said, Life and Death was not nearly as magical an experience as Twilight. Maybe because I’m ten years older now. Maybe because I went in thinking a male version of Bella was going to be hilarious. I don’t know. But here are my thoughts. Enjoy. Obvious that Smeyer is making the effort to make this inner monologue a bit more typical of a teenage boy, but he still sounds awfully wishy-washy. Beau’s description makes him sound like an Emo-Kid and even though he doesn’t say this at ALL, for some reason I’m imagining him with greasy hair and bad acne. That’s just the vibe his personality gives off. No way is he going to attract the hottest vampire girl in school. Why aren’t Renee and Charlie gender-bent? Why couldn’t Police Chief Charlotte Swan welcome her son home after her flaky husband Raymond left her and married Pro-Softball player Felicia? It could have worked, people. Come on. All these gender-bent guys are acting WAY too much like girls. Forgive me, I’m not meaning to perpetuate heteronormative stereotypes or anything, but really. It wasn’t that long ago that I was in high school. Guys don’t talk like that. Somehow, the gender-bent girls work. I can see a bunch of new girls flocking to the new boy in school. Although, once they figure out how much of a bummer Beau is, they’ll probably flock right back. Okay WHERE did Smeyer come up with the new names for the Cullens? These names are ridiculous. Royal? Archie? I’m having a really hard time remembering who is supposed to be who (although since this is supposedly an entirely separate work, I guess I’m not supposed to). Also, I’m very disappointed that neither Jasper nor James nor Jacob was renamed Jackie. Speaking of Jacob/Julie, there’s definitely not going to be a Renesmee or Ronaldo or whatever weird, gender-bent name might have been bestowed on the human/vampire spawn. So I’m guessing she ends up alone. I don’t know why, but I actually really like Edythe. I think she seems kind of kickass. That being said, I can’t imagine her falling for Beau who has the personality of a wet wash cloth. Seriously, I’m usually pretty big on the, “Why do these fictional heroines always go for the brooding bad boy? Why can’t they go for the sweet, nice, normal boy next door?” But Beau, again, is just… Blegh. Wow, this book is exactly like Twlilight but with gender-bent characters. I’m not buying the whole every girl in town is into cars. One? Sure. But come on, Smeyer, if you’re going to gender-bend them, make them kind of believable. Not one of my girl friends is into cars. My guy friends? Yeah. Like, all of them. Also Don’t make Royal drive around in Rosalee’s super girly car and then give Eleanor Emmett’s off-roader. Seriously. I know you’re trying to make a point that Bella isn’t a damsel in distress or whatever, but you didn’t even try to actually gender-bend them. You just changed the names and the pronouns. Okay, I finally realized why, as a female reader, Beau is unappealing to me. Other than the fact that he’s Bella Swan in boxer shorts. It’s because he has such low self-esteem. His whole inner-monologue (like Bella’s) is, “Oh, how could this gorgeous girl ever love me? Oh, she’s a goddess and I’m just a mere mortal. Oh, I’m so dull and normal.” As a woman, I have to come out and say it: That is NOT an attractive quality. Humility is great. We all love a guy who’s modest. But for the love of God, please have some sense of pride. Don’t base your entire self-worth on the woman you’re dating. For one thing, that puts way too much pressure on us. For another thing, if you don’t think you’re all that great, then why should we? I like a guy who sees me as a person, who’s comfortable around me. I’ve dated guys who put me on a pedestal before. It’s awful. It’s completely dehumanizing and unrealistic. I just… Grrrrr, Beau. Grrrrrrrr. But still, I really like Edythe. Somehow, Female Edward works. Okay… Instead of “dazzling” Beau says she’s “disarming with dimples” or something? Okay. Maybe it’s actually a good thing that Smeyer didn’t change all that much because that’s just excruciatingly awkward. “A part of her saw me as food.” Stop. Please, Beau. Just stop. I seriously just can’t with this piggy-back riding scene. This is so awkward. OMG. I’m trying really hard to picture Beau as someone more appealing, like Matthew Gray Gubler (who is actually my Michael Sinclair), but it’s just not working. I’m still seeing him as this gangly kid who wears stupid t-shirts and has oily hair and zits. I really think it’s the personality. I wonder what gender-bent Cemetery Tours would be like? Not that I actually have time to write it. I have way too many other stories that I want to work on first! I actually really like Carine and Earnest. They’re super sweet and somehow, they work. The rest of the Cullens? Not so much. Except maybe Royal. I can totally see this snobbish, scary, super full of himself blond vampire. Kind of picturing him as Malfoy’s older brother. I had no idea Joss was a girl’s name. I’m over here reading this and thinking Joss Whedon. Should have been Jackie. 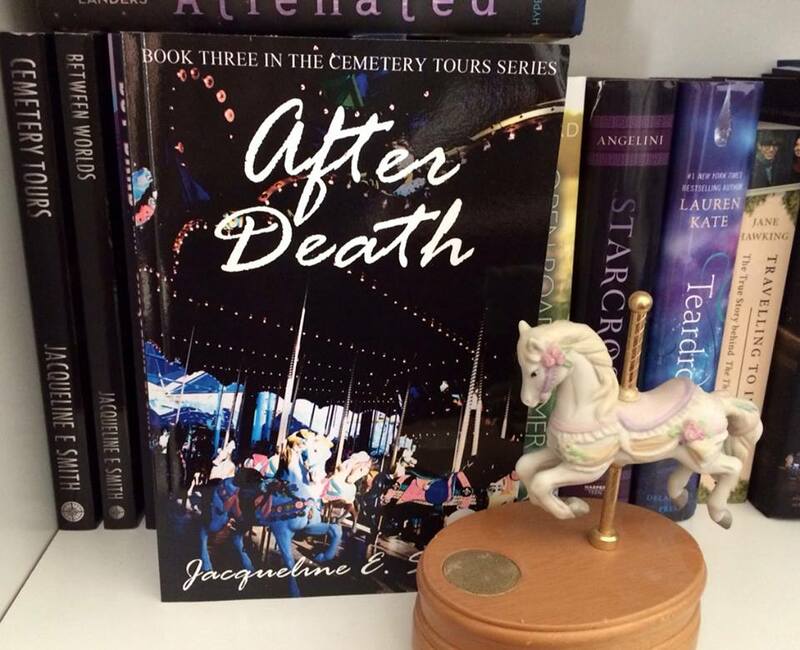 I’d love to read about evil vampire Jackie trying to take Beau out. Wait a minute. Wait a minute. Woah. Wait. This isn’t like just like Twilight. Okay, this alternate ending is somehow making the hours I just spent reading Beau drivel worth it. Well, sort of. Smeyer just somehow managed to cram all three of the rest of the series into about four chapters. Beau and Edythe are talking about marriage? Ew. I’m sorry. They’re so young. I can’t see them married. Just no. Although, I guess Edythe is 109. She definitely makes me feel like less of a cougar for liking a guy who’s three years younger than me. Still, if I was Beau, I’d be totally miffed at how all this turned out. Sorry. Interesting. Okay. Well. I read it. And there you have it folks. For me, the original will always be better. Fans of Twilight, though, I am eager to find out what y’all thought of the *new* Bella and Edward. It’s here! 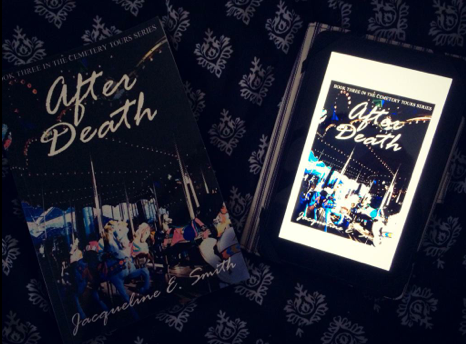 After more than a year, After Death is finally available in Paperback AND Kindle! I’m so excited for the ghostly misadventures of Michael, Luke, and Kate to continue. I hope you all enjoy reading them as much as I enjoy writing them! I want to take a little bit of time, however, to celebrate a few OTHER books being released today: Carry On by Rainbow Rowell, Life and Death by Stephenie Meyer, and of course, the illustrated edition of Harry Potter and the Sorcerer’s Stone. The fact that my book came out on the same day as all of these ladies is, quite frankly, a huge fangirl honor for me. JK Rowling is Queen, as everyone knows, and I don’t know a single person whose lives she hasn’t touched with her magical world. Stephenie Meyer, yeah, okay, it’s kind of fun to make fun of Twilight. But I’ve got to be honest. I still love it. I love the story. It’s just pure fun and fantasy, you know? Very escapist, and I do love to escape. Then, finally, there’s Rainbow Rowell. I fell in love with her writing after reading the story of my life, Fangirl. I’m serious. I’ve never read a book that so keenly described what it feels like to love a book and, frankly, to be apprehensive of the world outside. Oh my Heavens, do I love Fangirl. As if I didn’t already love Rainbow Rowell enough for bringing that story to life, I then got to meet her last May. She is incredible, basically everything I want to be as an author and as a person. When I found out that her new book, Carry On, inspired by the book series in Fangirl, was being released the same day as mine, I was thrilled. And yes, I’ve already run out and bought my own copy. 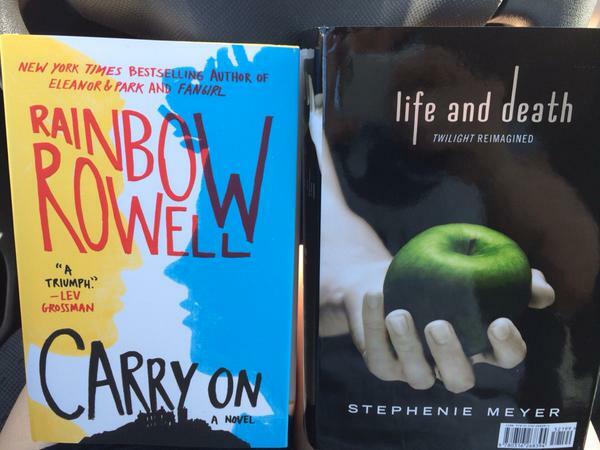 Yes, I bought Life and Death too. I wanted to buy the new Harry Potter, but let’s face it, as an Indie Author, I barely have two dimes to rub together. I really shouldn’t have bought these two books, but I can’t help it. I have to support the authors and stories that I love. And, yeah, okay, I really need to feed my addiction to YA literature. Most importantly, though, these books serve as a reminder of why I do what I do and why I put so much time and effort into my books. I want this world of words to be my world, too. Happy Bookday, everyone! Go read your favorite book! Or, if you’re feeling adventurous, go pick up something new! May I recommend a ghost story?